Voila produces a hybrid mattress, using a mix of foam and pocketed coils, which is a different construction from most bed in a box companies. Along with the difference in construction, Voila is taking aim at a different consumer than most bed in a box companies and has a higher price tag more in line with online-only innerspring mattress options. Is the hybrid mattress construction of the Voila worth the higher price? Read on to see if it would be a good fit for you. The Voila mattress features three different firmness options, offering sleepers the chance to customize their own comfort! Enjoy 10% off your mattress by using the code SLEEPOPOLIS10! Love that hybrid feel? Check out my best hybrid mattress picks. The Voila mattress comes in three different firmness levels. Today we’ll be taking a look at the Plush version. 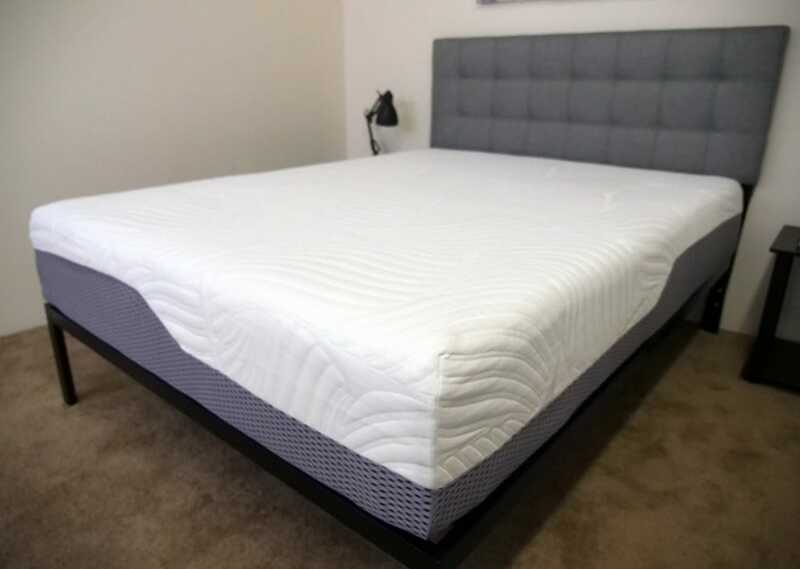 Cover – The cover is a stretch polyester knit that’s thin to help with breathability of the mattress as well as to not interfere with the feel of the foam layers below. The side of the cover is made of mesh to improve airflow into the mattress for temperature regulation. Top Layer – This layer is made of gel memory foam, which is slow to respond to pressure and good for pressure relief. Gel memory foam is used to provide the classic memory foam feel of sinking into the mattress while still staying cooler, as traditional memory foam can retain too much heat. 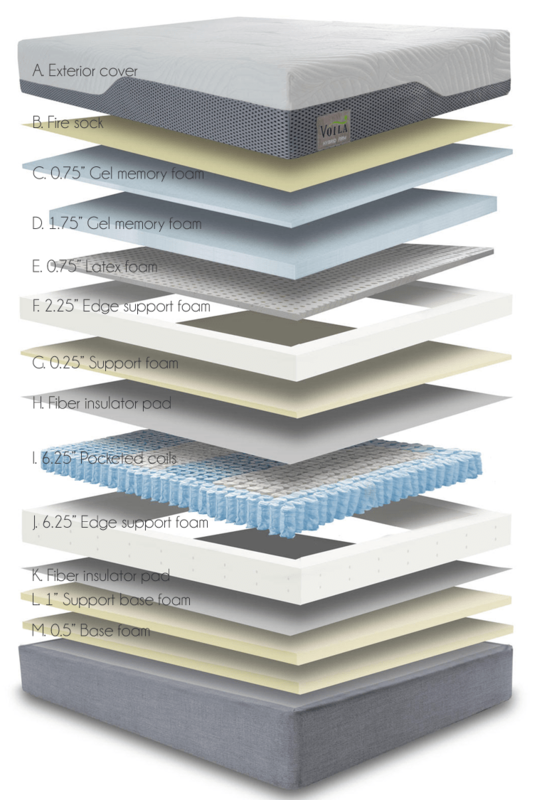 Second Layer – The polyfoam edge support layer on the outside responds quickly to pressure to help support the sleeper near the sides of the mattress. Hidden behind that edge layer is a latex foam layer that is very springy and gives the mattress some bounce. The latex layer helps the sleeper move around and easily change positions as a thick memory foam layer on top can sometimes cause people to feel stuck in the mattress. Pocketed Coils – Below these foam layers are pocketed coils. These are great for reducing motion transfer (which we’ll test later in the review). These coils are specially zoned to provide extra support to heavier parts of the body. I found the addition of the coils to the construction of the mattress to provide a greater level of support than strictly foam mattresses. These coils also tend to be a bit more durable than foam as well. Edge Support Outer Shell – Surrounding the pocketed coils is an outer shell of dense poly foam. This portion is meant to support the sleeper, especially near the edge of the mattress. I take a closer look at edge support later in the review. Some layers of Voila mattress hidden by edge support shell. For accurate breakdown see below image. D – 1.75″ Gel Memory Foam (4.0 lbs) – 2nd comfort layer, works in coordination with the top gel memory foam layer to create pressure relief, support, cooling, and feel. This layer is denser by design, as it acts in more of a supportive function than the top layer of memory foam, which is more for comfort. 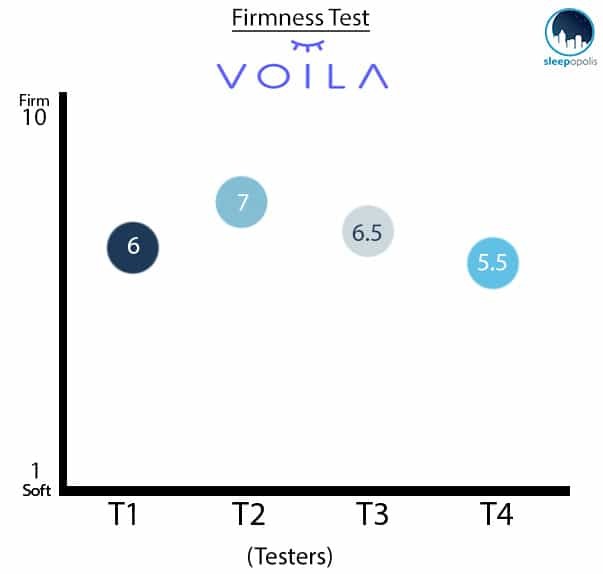 As you can see from the chart above our testers felt that the Voila has a medium firmness to it. There is an initial softness to the mattress, thanks to the top layer of gel memory foam, followed by a springier feel from the latex layer below. On my back the gel memory foam fills in the space beneath my lower back as I sink into the mattress a bit but the latex layer underneath helped keep me from feeling stuck. Once on my side, the memory foam really helps relieve pressure and I felt support from the pocketed coils beneath. Overall, I think the Voila Plush is a good choice for side sleepers. Stomach sleepers can often feel pressure points in their back when on a mattress that is too soft. When I moved to my stomach I did feel pretty supported, but the plush model may be a bit too soft for strictly stomach sleepers. 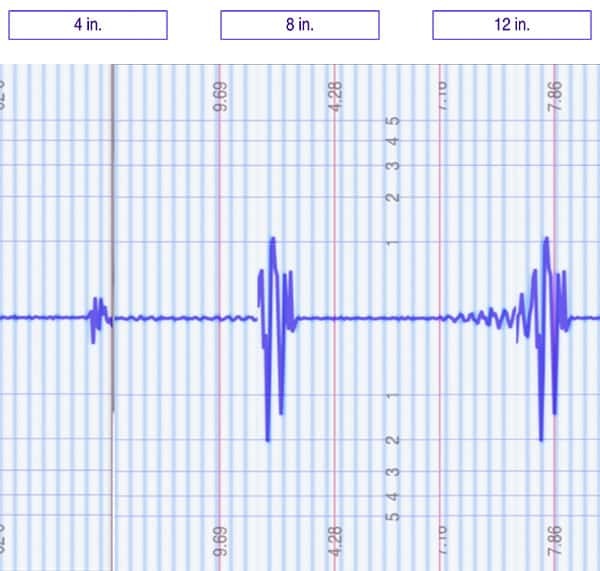 To give a visual representation of where someone may feel pressure points while lying on a Voila mattress, I placed a pressure map on top of the mattress and lied on my back, side, and stomach. On the image below pressure will be represented from blue (low pressure) to red (high pressure). 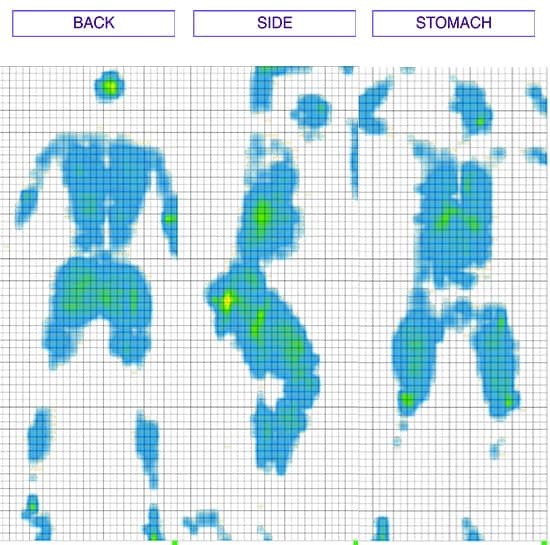 The pressure map confirms what I felt while lying on the mattress by showing mostly blue, low pressure, areas in all positions. While on my back there is mostly blue throughout. The gel foam on top does a good job of helping with weight distribution to eliminate pressure concentrating in one place. Sleeping in pain? Check out my best mattress for back pain picks. Side sleepers can see issues in the shoulders due to increased pressure but the Voila does a good job of relieving that here. Overall I think this could be a good choice for side sleepers. Once I roll to my stomach my weight is again distributed evenly and no pressure points showed up on the map. I was expecting to see higher disturbance levels with the Voila as the use of coils and springy latex foam could cause more motion transfer than strictly memory foam. As you can see from the results above, the Voila performed pretty well on the motion transfer test with the memory foam top layer doing a good job of reducing the disturbance felt on the other side of the bed. The 4 inch drop barely registered any disturbance on the other side of the mattress as it appears to not have gone through the memory foam top layer. While the 8 and 12 inch drop disturbances were a bit bigger, they still look within reason (to me) when compared to other mattresses. Voila included two different edge support layers in this mattress to ensure that you won’t feel like you’re going to roll out of bed when near the side. The edge support around the latex foam as well as the pocketed coils do a nice job of keeping the shape of the mattress even when I was hanging off the bed a little bit. I felt even support from the center of the bed to the side. The dense edge support polyfoam also does a good job when I am in a seated position with my legs over the side of the bed. Note: take 10% the prices shown below with coupon code “SLEEPOPOLIS10”. 250 lbs or more? See my best mattress for heavy sleepers page. Is the Voila Mattress right for you? Looking for a hybrid mattress with a bit more pressure relief – If you’re a bit heavier or a side sleeper, this could be a good choice for you. If you’re looking for different firmness options – If you like the structure of the mattress but are looking for something a little firmer Voila offers three different firmness levels. 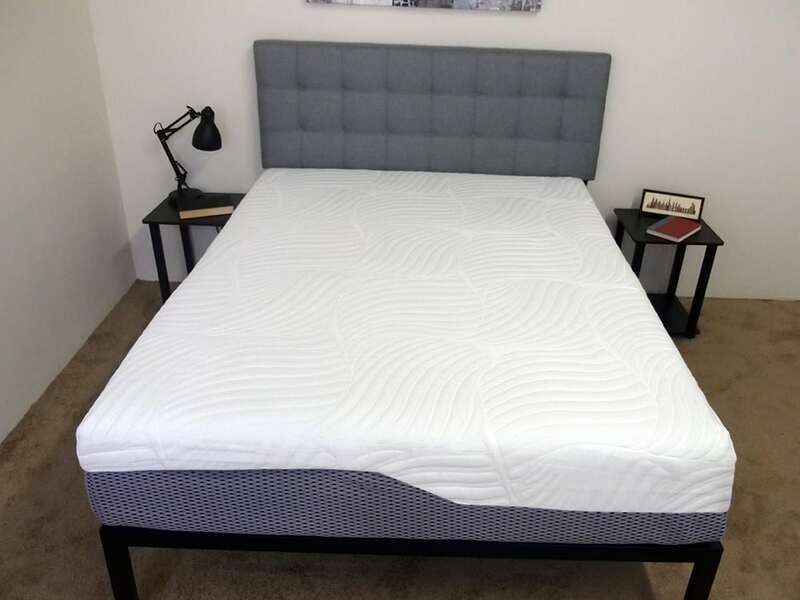 If you’re looking for a memory foam feel but need more support – Because of the pressure relief of the memory foam on top and the support of the pocketed coils this hybrid is a good choice for people that would like a mix of both. Want more information on the Voila? Visit VoilaMattress.com. As a hybrid mattress, the Voila is a good option for the sleeper looking for high levels of bounce, edge support, cooling, and comfort. With a moderately thin cover, the Voila mattress allows the sleeper to be in closer contact with the foams directly beneath them. With that said, there is no drastic amount of sinkage associated with Voila. This mattress offers more of a floating feel. With three different firmness options available, the Voila is a great choice for the sleeper looking to go outside of one-firmness-fits-all mattress.